In this collection, the authors open with a review of current state of the art methods for the recovery and reuse of selected monomers and biomacromolecules (such as proteins and nucleic acids) from municipal solid waste. They discuss the most relevant recoverable chemical building blocks and biomacromolecules, as well as their potential applications. Following this, polyethylene terephthalate is analyzed as one of the major post-consumer plastics in solid waste streams because of the ongoing expansion of the PET bottle market. A study is conducted wherein co-pyrolysis is proposed for co-processing PET wastes with woody biomass in order to improve the quality and yield of liquid products for their use as fuels. A subsequent study proposes a recycling process for the recovery of zinc and manganese from Zn-Mn batteries, the goal of which is to determine the optimal conditions of manganese and zinc extraction from black mass of spent zinc-manganese batteries. The ability to obtain final products such as manganese oxide(IV) from recycling material makes it possible to use them in new batteries. Also in this collection, the authors synthesize wood ash based geopolymer to determine its optimal conditions. An almost complete disappearance of spherical forms and increasing the porosity of the structure of the obtained geopolymers were observed, and moreover, spectroscopic analysis was performed and the specific surface area was determined by the BET method. 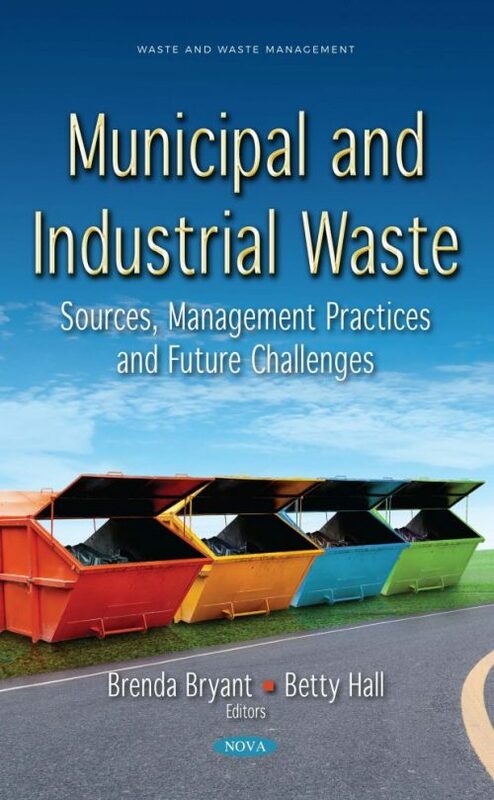 Another study details the aspects of waste generation sources and management practices such as collection, storage, transportation and disposal in an environmental and economic manner, along with upcoming challenges. A review of sludge pretreatment and extracellular polymeric substance extraction enhancing the sludge management process is presented. The intensification process applied to the wastewater treatment, the integration process applied to wastewater treatment, and the biorefinery concept integrated to wastewater treatment plants are reviewed, summarizing a range of possibilities for improving the sustainability of the industrial production chain. Next, the book focuses on agricultural biomass residues such as corncobs, sunflower husks, olive stones, peanut shells, pistachio shells, pine sawdust and brewery waste, in order to determine the general characteristics and the specific properties that make them suitable for incorporation into clay mixtures for the production of ceramics. Their chemical compositions and morphological structures are analyzed. The closing paper describes the equilibrium and kinetic studies which contributed to our understanding of the properties of the new sorbent such as chemically modified coal fly ash. Based on the sorption capacity obtained, modified coal fly ash is proposed for the treatment of wastewaters containing heavy metal and dye.